Ductless fume cupboards provide cost benefits over ducted systems by eliminating the need for ductwork changes in the laboratory as well as utility savings; however they are limited in the types of chemicals and the quantities of those chemicals that they can handle. The purpose of this application guide is to provide information as to the proper use of the ductless fume cupboard. The use of activated carbon filters in ductless mode is dependent on the chemicals being used and the quantity of chemical being evaporated into the filter. Generally speaking, chemicals with a molecular weight over 30 and a boiling point higher than 60°C are candidates for adsorption with carbon filters, but there are exceptions and combinations which need to be evaluated by your supplier. Carbon filters have retention capacities which can be pre-determined and your supplier should be able to predict the amount of chemical in grams or ml capable of being retained by the filter prior to any measurable desorption taking place. This is done by using data from the carbon supplier, testing under dynamic conditions, extrapolation from available data, and engineering judgment. Air Science® ductless fume cabinets incorporate our exclusive Multiplex™ high performance activated carbon filters, which is the primary filtration component in removing all chemical fumes from within our products before air is recirculated back to the laboratory. Activated carbon exhibits excellent adsorbent characteristics that make carbon very useful for a wide variety of processes including filtration, purification, deodorization, decolorization, purification and separation. The effectiveness of activated carbon as an adsorbent is attributed to its unique properties, including “large surface area, a high degree of surface reactivity, universal adsorption effect, and pore size". Activated carbon is produced from a wide variety of carbon-rich raw materials, including wood, coal, peat, coconut shells, nut shells, bones and fruit stones. New materials are currently under investigation as sources for activated carbon. This technique is generally used for the activation of peat and wood based raw materials. The raw material is impregnated with a strong dehydrating agent; typically phosphoric acid or zinc chloride mixed into a paste and then heated to temperatures of 500 - 800°C to activate the carbon. The resultant activated carbon is washed, dried and ground to powder. This technique s generally used for the activation of coal and coconut shell raw material which is usually processed in a carbonized form. Activation is carried out at temperatures of 800 - 1100°C in the presence of steam. and checking the exhaust air for chemical contaminants to ensure the main filter has not reached the breakthrough point. Airflow can be measured with an anemometer. There are a number of anemometer designs available including propeller, hot wire and vane anemometer. In addition, most ductless fume cupboards are fitted with a low airflow alarm which indicates a low airflow situation as well as fan failure. 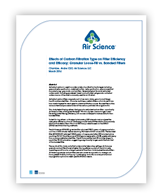 Air Science uses high-quality centrifugal fans to ensure that airflow is maintained even as the pre-filter airflow resistance increases. Filter monitoring should aim to detect the period of initial breakthrough and in all cases should warn the operator well before the permissible exposure level (PEL) is reached. Adsorption takes place in a filter bed in what is known as the active filter zone (represented above as dark saturated area). As the filter is used this active zone progressively moves up the filter bed until it approaches the top surface of the filter. At this point there is an initial breakthrough by the contaminant vapor(s), and thereafter the percentage of contaminant gas that escapes filtration increases. Filter monitoring can be performed with gas detection tubes. Most of the units have test ports allowing the use of this equipment in a zone immediately above the main filter. The filter is challenged with a known chemical, and the concentration of this chemical in the exhaust air is measured with a suitable detection tube. The safety of this process is enhanced by the use of safety back-up filters that prevent any contamination coming from the main filter from being recirculated into the work area. Electronic filter saturation alarms which use special gas sensors are also available. These alarms provides continuous monitoring and remove the need for manual testing. Such sensors are sensitive to a wide range of hydrocarbon contaminants used in the laboratory, with a detection sensitivity of a few parts per million (PPM).